In a recent post in the Scout Patch Collectors Facebook Group I had trouble remembering when the hobby’s largest online watering hole got started. Luckily I have a very good reference that I went back to in order to get the date straight. Back on February 22, 2012 I interviewed Brad England for my podcast Scouting Hot Finds Radio. I recorded the interview and it was “off-air” that Brad and I came up with the idea of creating a Facebook Group. Brad was already doing a lot of trading through Facebook and creating the group was just a natural fit. We came up with a name and started the group. My recollection is that it took off incredibly fast and by that summer we had maybe 1,000 people. By 2014 the group hit 5,000 and at the close of 2016 it’s approaching 12,000 members worldwide. 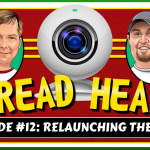 The follow up episode of the podcast aired one week later on leap day February 29, 2012. So officially the group was launched after the February 22 episode as you will hear me talk about that in the intro. It was an idea that was right for the time. This episode of the podcast really breaks down how Brad England was using Facebook to trade. 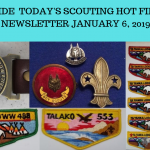 You will also hear that although there was already a Patch-L Facebook Group but nobody was using the platform for frenetic posting and trades that has become the signature of the Scout Patch Collectors Facebook Group.